TS1 cross-border service between Singapore Changi Airport and JB CIQ (Customs, Immigration and Quarantine Complex) operated by Transtar is now available for online booking on BusOnlineTicket.com! 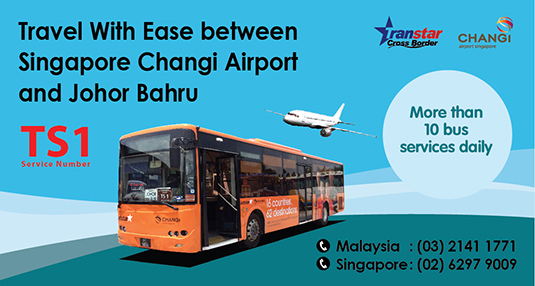 TS1 cross-border service offers great convenience for all passengers who shuttle between Changi Airport and JB CIQ. Boarding point is at Changi Airport Terminal 2 Coach Bay. Passengers who land in Terminal 2 can proceed straight to the coach bay located at Terminal 2 Arrival Hall to board the shuttle service onward to Johor Bahru CIQ. For passengers who arrive in either Terminal 1 or Terminal 3, please take the skytrain to Terminal 2. Upon arrival in CIQ, there are plenty of taxi and city bus services to bring you to your destination. The duration of the journey is estimated 1.5 hours. Journey duration is subject to change depending on traffic conditions, especially at respective Customs. Bus fare is reasonably priced at SGD10 per passenger. There are 12 schedules daily to meet the demand of passengers travelling from Singapore Changi Airport to JB CIQ. Boarding point from Johor Bahru CIQ is at the bus terminal of Johor Bahru CIQ. Passengers who wish to take flight at Changi Airport are advised to plan your schedule carefully, such that you can check in on time for the flight. The duration of the journey is estimated 1.5 hours. Journey duration is subject to change depending on traffic conditions, especially at respective Customs. Bus fare is reasonably priced at SGD6 per passenger. There are 12 schedules daily. For the latest TS1 service schedule, please visit Transtar's website.